Here you can read all about Blackjack and what Blackjack games we can offer at Dealers Casino. You are probably aware of blackjack. This famous card game has featured in many movies and it is perhaps the most recognized casino game in the world. Dealers Casino offers many different types of blackjack. You can even play a live version against real-life professional dealers thanks to our partnership with Evolution Gaming, the award-winning live casino company. If you are going to play blackjack online, you need to know how it works. Here are some straightforward easy to understand instructions about the basics of the game. In blackjack, the aim is to get a higher score with your cards than the dealer without breaking 21. So, the perfect hand is two cards adding up to 21. You do not play against other players, it is just you versus the dealer. Once you are given a card, you can either “stand” or “hit”. If you decide to “hit”, the dealer gives you another card. You will choose to hit if you believe another card gives you the best chance of getting near 21 without exceeding it (if you are playing in a “real-world” casino, you ask for a card by tapping the table with your finger instead of saying “hit”). If you choose “stand” that means you stay with the cards you have already received. You should do this if you think the cards you have are likely to win, or that you will go over the score of 21 with another card. Generally, a dealer will choose to hit if they have 16 or less. If your hand is 17 or lower your only real chance of winning is for the dealer to bust (go over 21). The hardest decision when playing is if the dealer has a low card showing and your cards come to 12 or more (of course the closer to 21 you get the easier it will be to stand). You will have to decide whether to hit or stand. With a low score, your chances of winning are low, but another card, if it is a high one, could bust you out of the game. It is a up to you and there is no absolute certainty – that is why they call it gambling! Below you can find a quick guide over how to play according to your cards and the dealers cards. We have outlined three of the most common rules to help you get started as a new player. Please use these rules as a guideline and with care. If the dealer is showing an ace, you can buy insurance against them having a blackjack (i.e., two cards adding up to 21). You can put down an extra 50% of your main bet for insurance that will be dealt with as separate from the rest of the hand. The dealer will then look at the facedown card to see if they have blackjack. If they do not, the game carries on. If they do, and you do not, the dealer wins the main hand, but you will be paid on your insurance at 2:1, so basically you come out even (e.g., you bet €5 and take €2.50 insurance. If the dealer has blackjack, you lose your $5 bet but receive €5 back from the insurance, but the insurance of €2,50 is lost.). If both of you have blackjack, the game ends in a tie (a “push”) and you get your stake back. Remember you can only buy insurance if the dealer is showing an ace, not a ten or a picture card. If a dealer does not have blackjack after checking the two cards they have been dealt, you and your fellow players have the opportunity to improve your hands. The dealer goes around the table clockwise asking if each player wants any more cards. If your two cards do not add up to 21, you may Double Down. This means you double your bet and get just one more card. You may instead decide to hit, then you will be given another card; you can hit as many times as you like until you are happy with your hand. If you start with a hand with two identical cards, you can split them into two separate hands, betting separately on each one. The dealer will give you a second card for each hand, and then you can decide whether to stand or hit. You can hit as many times as you like, except if you have two aces: then you will just get the one extra card and have to stand on whatever that makes. 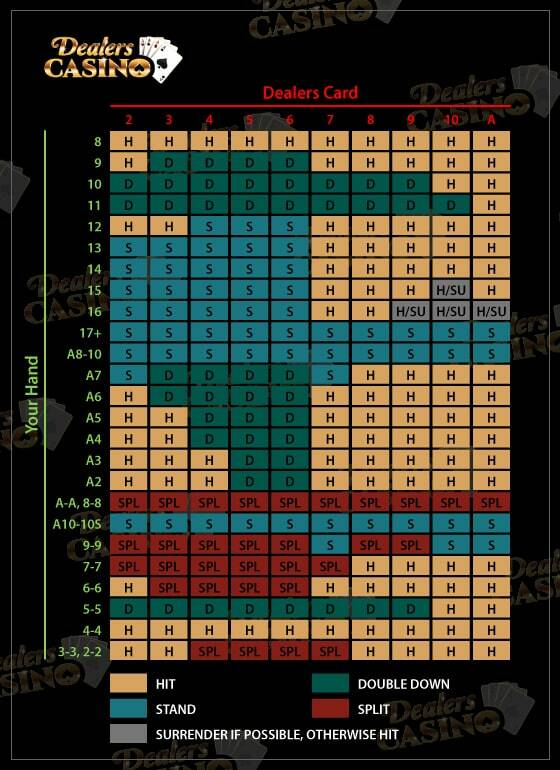 To give you a better understanding of the online blackjack games at Dealers Casino, we have made a small guide. Below you can find a list with some basic explanations of the games. The Blackjack Solo casino games is our version of playing blackjack on your own, where you play against the computer. Blackjack Solo uses eight standard packs of 52 cards shuffled together. The cards from 2 to 10 are worth their face value. All picture cards (kings, queens, and jacks) are worth 10, and aces can be worth 1 or 11. If the ace would take your score over 21 when counted as 11, it is counted as 1. In Blackjack Solo it is just you versus the software in the classic casino game. Blackjack Solo can be found within the casino games section in Dealers Casino’s games lobby. You can bet a minimum of €0.25 on each hand and go up to a maximum of €100. On average, the player will receive 99.55% of their stake back (this is called the theoretical return to player). Blackjack Classic is played with eight standard packs of 52 cards shuffled together. The difference with blackjack Solo is that you can play up to three hands against the dealer at the same time. Blackjack Classic is also in the Dealers Casino casino games section. The theoretical average return to the player is 99.51%. Allowing players to enjoy blackjack with real human dealers is the very latest thing in the online casino business. Dealers Casino has joined with Evolution Gaming, an award-winning provider of live casinos, to offer this to our players. 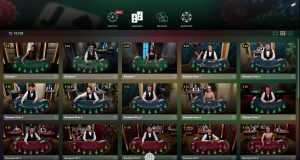 In live blackjack you have a real dealer who you can see through live video streaming (unlike at the Solo or Classic versions), and up to seven players can sit at the table together; they can also see and chat to each other. It is as close as you can get to being in a casino without leaving your own home. Many players still enjoy the experience of standard online blackjack, but playing live blackjack online is for many the ultimate casino experience. 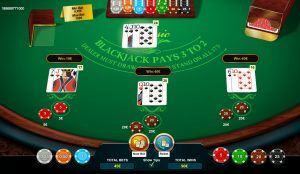 Live blackjack is part of the Live Casino experience and is only accessible to players who have Dealers Casino accounts. 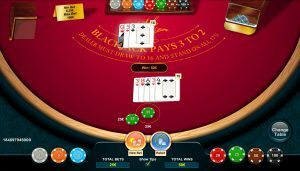 Live blackjack is played to the same rules as our other online blackjack games, i.e., it is played with eight standard 52 card packs shuffled together. Cards valued between 2 and 10 count face value, picture cards (kings, queens, and jacks) count 10, and aces count 1 or 11, whichever is best for your hand. In the blackjack Lobby, where you will be taken when you click on the live blackjack section, you will see the choice of 25 tables with different limits, so you can choose a table that suits your requirements. The minimum bet at Dealers Casino live blackjack is €5 and the maximum is €10,000. The theoretical return to player in live blackjack is 99.28%. If you have any queries, please do not hesitate to speak with our support team.